Have you ever heard the saying of ‘It’s not about ideas. It’s about making ideas happen’ by an American entrepreneur Scott Belsky? We have, which is the reason IdeaText has been created. A small team of highly passionate language industry experts, each with over 10-year experience actively working in the field, co-founded the translation services company IdeaText with a clear and definite idea – to help you tell your business success story to the world! IdeaText offers a wide range of translation-related services. Our experienced team of project managers and collaborating specialists can go from as simple as basic text translation to as complex as multilingual voice overs, desktop publishing, localization and more. We really care about our product. That is what sets us apart. Our top goal is to provide you with the best possible translation by using highly qualified native-speaking translators, in-field professional editors, multi-level quality assurance processes and tools and, most importantly, your feedback. IdeaText employs over 1500 professional translation, editing, and other specialists. This means we can tackle any challenge you may have. Each and every individual we employ undergoes thorough skills testing and experience vetting. Quality is our main priority. Therefore we make no compromises in what we expect from our specialists. They are at your disposal as soon as you contact us. With each and every assignment IdeaText has proved to be the experts in the field. The knowledge and wide spectrum of languages and industries they provide serves as a one stop shop company for all of our translation needs. The project managers at IdeaText are not only professional but friendly as well. I recommend IdeaText as an excellent translation partner. Our team has only positive feedback about their experiences with IdeaText’s translation services. In addition to consistently delivering polished, edited translations on time, IdeaText responds quickly to our requests. Their project managers deserve special mention for the attention and care they provide their clients. They are responsive and eager to help, and their positive attitude make every exchange pleasant. Everything is perfect. The quality is always a spot-on and the short deadlines have never been missed. We strongly recommend IdeaText as they are a competent and a reliable Scandinavian language service provider. 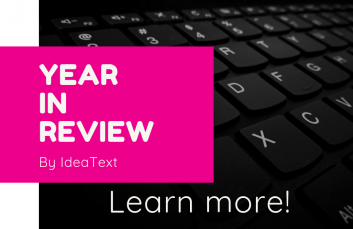 I wanted to thank IdeaText for the excellent service your firm has provided over last year. I know my team challenges you with a wide range of languages and some tight deadlines and your team rises to the occasion every time. I am also glad to report that the quality of the work has been very solid. Our project managers are very pleased. Keep up the good work, and thank you for your great service! Working with IdeaText has been a pleasure. They have been a reliable partner, well organized and quick with replies in case of questions.